Stuck in Olvera, Spain with a very small budget, I needed to fly from London to Cape Town, South Africa. The going rate varied from £399 (Dubai airlines) which had a sale to about £1500 for an economy seat with South African Airways. What with airlines disappearing in the middle of the ocean, altering flight, being shot down, and depressed pilots dooming their passengers to death, I wanted my flight to be both safe and cheap. I eyeballed both Dubai Airlines and Turkish airlines as having the cheapest prices. Turkish Airlines came in at £499. I then took a seat on Ryan Air for £60 to London. Yes, I actually did see people spread out on seats like that sleeping! As it happened, I had a friend whose son was a jet engineer and who worked in the industry. A quick call established that Turkish airlines was safe and had a good flight record. What one pays for a flight ticket is dependent on three factors – what date one is going to fly on, whether you’re flying to or from your home, and which internet site one uses. While Google Flights is one of the top choices, for myself, I have found that the cheapest prices (for the same flights) come up on Skyscanner. Also when flying with cheapie airlines like Easy Jet and Ryan Air, the airlines takes your home port into consideration. 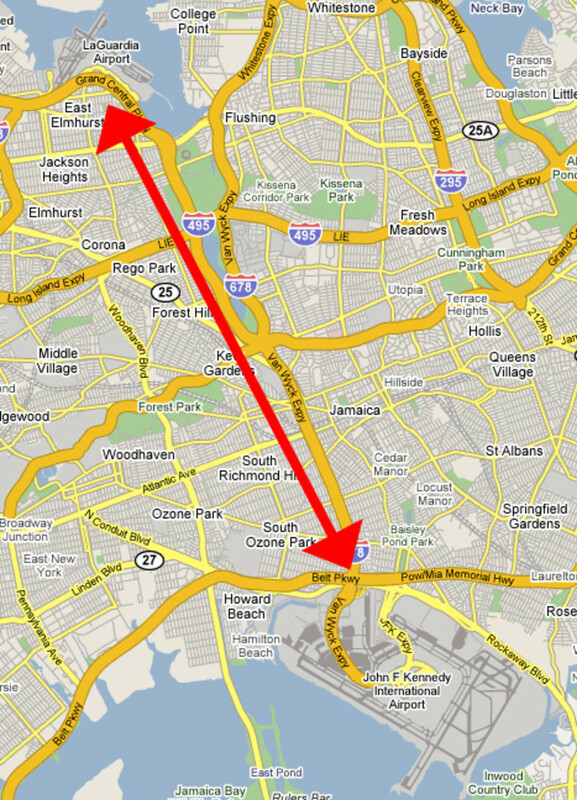 My cheat around that is to login to the site and fill in my address as the port from which I am flying. So, for instance, when I was flying from London to Seville in Spain (one way), I gave my address as one in London, and when I was flying from Seville back to London a few months later, I gave my address as Seville. The airlines will give you a one way cheap flight to your destination but will charge you double the price when you want to wing your way back. Always book your tickets in midweek, with Tuesday being your cheapest day. You will also find that some airlines like SouthWest in America have a calendar in the top right hand corner which enables you to look which date is the cheapest to fly on. Generally there are one or two days in the month which are far cheaper than the other dates. This is generally the date on which the fewest people fly and the airline is trying to fill seats on that date by offering bottom dollar prices. In some instances, an airline like United will use a British Airways flight, so in October 2014, I flew Boston to London for about $350 in a really nice plane. So far, in 2015, Turkish Airlines has been awarded "Best Airline in Europe", “Best Airline in Southern Europe” and awarded “World’s Best Business Class Airline Lounge”, and “World’s Best Business Class Lounge Dining” in 2015 Skytrax World Airline Awards. Numerous other awards by many different business entities has also been awarded so far for 2015. 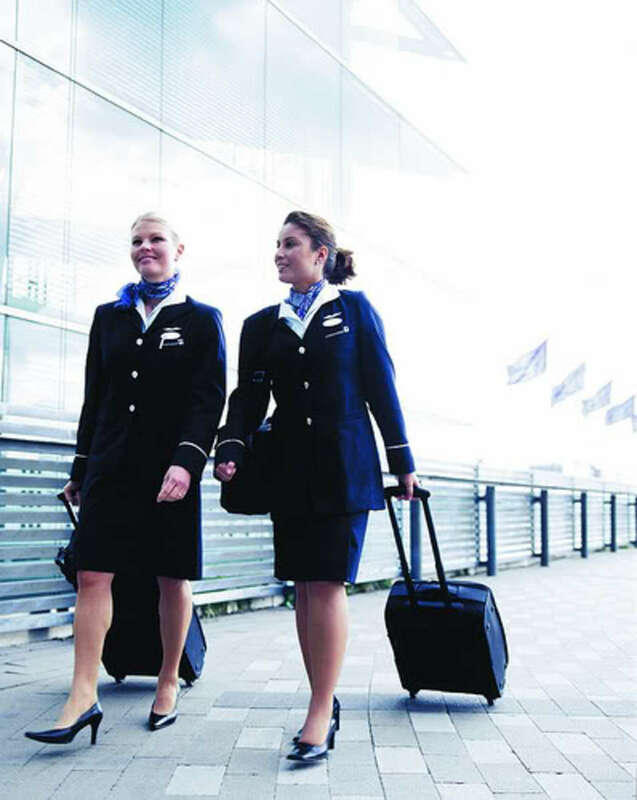 It has won the "Best Airline in Europe" for five years consecutively. In 2014, Dr. Temel Kotil, the CEO of Turkish Airlines was selected as Leader of The Year for the 2014 Air Transport News Awards. It was the second or third time he won the award. A full list of their awards can be found on their website. Suffice to say that they're in competition with the world's foremost leading airlines, and they're carrying off all the major prizes and accolades. That's not easy! My flight was from Stansted Airport on Tuesday in August. The airport security wasn’t as tight as some, my worst ever being from Seville to London where I passed through four or five passport and flight tickets checks at each point one had to pass through. When time came to board, it went quickly – the checking of passports and tickets only once. Turkish Airlines flies to 222 international destinations plus another 45 destinations in Turkey, in 108 countries. No other airline does that. They cover the Americas, Asia, Africa, Australia, and Europe. 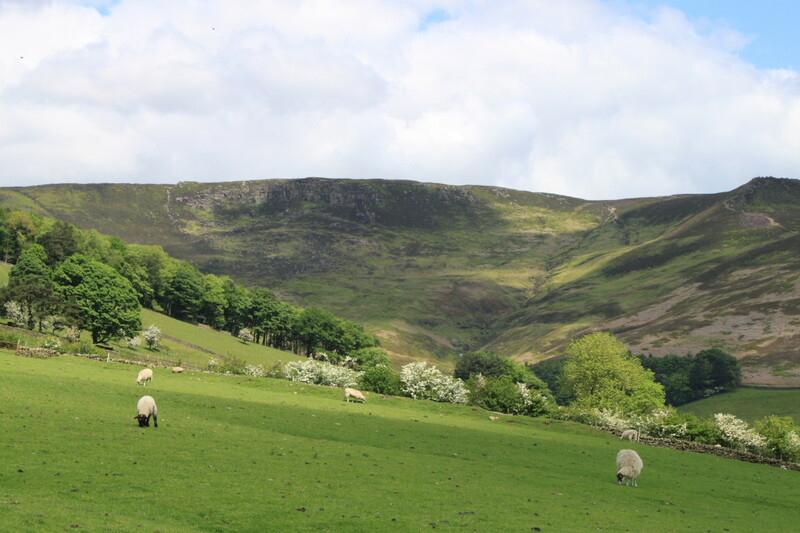 Also included are destinations that don't quite have a country or a continent to cover them like Hong Kong, Kosovo, Northern Cyprus and Taiwan. My jaw dropped when I saw the seats. Luxury and loads of legroom in the economy section. One would normally expect that kind of seating to be in the business class or thereabouts. 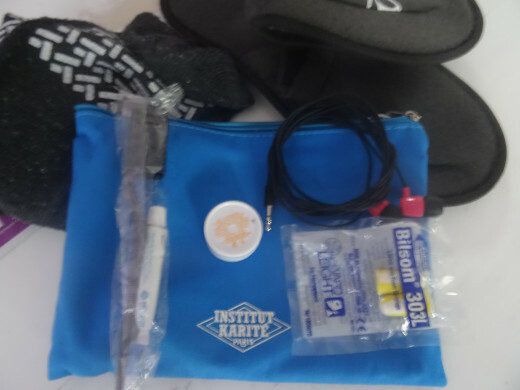 Each seat was supplied with a blanket, a pillow, and a small pouch labelled Institut Karite Paris which contained an eye mask for sleeping, a pair of bedsocks, a small container of lip balm, some ear phones, a toothbrush and a small tube of Miradent toothepaste, ear plugs, and a pair of slippers. Each seat had a small screen attached to the back of the seat in front of one, with a list of current and past movies available to view. A pair of excellent ear phones were on every seat. Socks, earplugs, Toothbrush and toothpaste, earphones, lip palm, slippers, eye cover, bed socks in suedette bag. Both flights, the initial phrase from London to Istanbul, and the latter flight from Istanbul to Cape Town had a superb menu plan. Drinks were free. Passengers had the choice between spirits like Whisky, Gin, Vodka, and Raki through beers, fruit juices like freshly squeezed orange juice (and it was) and homemade lemonade with mint, the conventional soft drinks, tea and coffee, and kiddie’s drinks like cocoa. Each flight presented a good meal. Menus on each flight had a choice. Grilled herb chicken fillets with chickpea ragout, sautéed zucchini, and saffron rice. Desert: Wild berry jelly and vanilla crème fraiche. Oven fresh bread selection with cheese. In addition, somewhere en route to Istanbul, the hostess came around with a delicious piece of genuine heated Turkish Delight wrapped in a serviette and later with a warm wet flannel to wipe hands. Luxury at its best! Starters: Chicken curry and pineapple salad served with each either choice. Choice one: Traditional style baked mince beef pastry with grilled zucchini and roasted red pepper. Choice two: Traditional Okay Stew with tomato sauce and buttered rice. Desert: Wild Berry Jelly – Vanilla Crème Fraiche. Selection of cheese served with fresh roll. White cheese, gouda, marinated black and green olive. Scrambled eggs with Turkish style cheese puff pastry. Sauteed mushrooms, grilled tomatoes, and green pepper. Oven fresh bread selection with butter and jam. The flight from Johannesburg to my destination, Cape Town, provided drinks and nibbles like freshly baked rolls and cheese with good coffee. At no time were any drinks or food paid for. This was included in the price of the ticket. 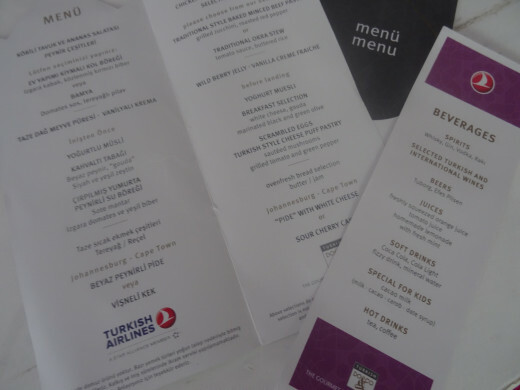 Turkish Airlines presents a printed menu with the choices set out for the meals. Their English isn’t wonderful, but then my Turkish is non-existent. I could understand what they were saying and that was all that was necessary. For the first time, in a life time of international and local flights, I understood the safety procedures. This was because while the flight attendants were explaining it, they actually demonstrated the inflation of the float devices and simultaneously a video was playing on the screen in front of each seat. It was the best explanation in my half century throughout the world. The selection was excellent providing something for all tastes, and I was able to catch up on some of the screenings I had missed during my previous four months of travel. Earphones were clean, in a packet placed on one’s seat. The sound was clear and one was able to adjust to a comfortable volume. When the captain wished to speak to the passengers, the movie automatically went off, but resumed at the same place when the announcement was over. I needed something to drink at one point before the flight took off. The flight attendant immediately brought me a glass of water. I observed that attendants paid substantial attention to the needs of their passengers, and it took me back to the days of flight during the 60s and early 70s. I was permitted to carry 35 kilos to check in, plus the normal cabin luggage, plus a largish bag. Luggage was safely transferred during the two hour break in Istanbul. I would wish that I had known that I was only in a smallish section as I would have explored further, but there are no English (or other language) signs which indicate where further stores can be found. I only discovered that just before we boarded our next flight when overhearing several other passengers talk. However, there was a range of delicious coffee to buy at the airport and waiting wasn’t too tedious. Deplaning in both Istanbul and Cape Town was quick and easy. I’m not quite sure why, but perhaps the aisles in the plane aren’t quite as narrow. I certainly found it easier than normal to get my cabin luggage from above. re on our way again. No, but after reading this, I will. No, but I have my favourtie airline, and I'll stick to that. Yes, but I wasn't impressed. Would I fly Turkish Airlines Again? Absolutely YES! Most certainly – so much so that I have already been to the local travel agent to make an early reservation for my flight to San Diego Comic-Con International in July 2016. Of course, Turkish airlines may not be available all the way to the US, but I will most certainly ensure that my flight to London uses that airline. For the record, Turkish Airlines flies the greatest number of any airline in the world.